Who inspired your love of cycling? Who nudged you forward – gave you an introduction to cycling, an invitation to their favorite trail ride, a little help getting up that hill, or a lot of help getting out of bed every Saturday? Who sparked your love of bicycles? Who changed your life forever? Nominate the person who started your cycling obsession and they could win the bike of their dreams from Liv Cycling or Giant Bicycles – and, guess what? You can win, too! *If you or your nominee already has a sweet bike or can no longer ride for one reason or another, you can choose to #LivForward and give your prize to someone who could really use that shiny new bike! Share a video or photo on your personal Instagram account of the person who helped you start your cycling journey and don’t forget the caption – tell us a story we won’t forget. Tag #GiveBackLivForward AND #LivForward. Make sure your account is public! The contest begins Thursday, April 11th and ends May 30th. 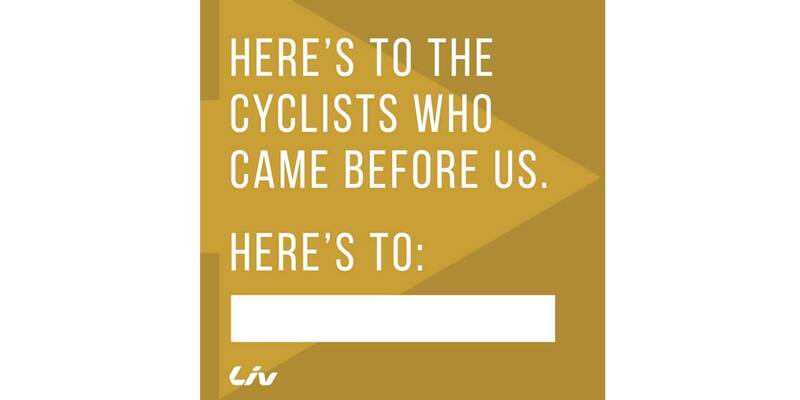 Don’t miss your chance to thank the person who introduced you to cycling! NO PURCHASE NECESSARY TO ENTER OR WIN. A PURCHASE WILL NOT INCREASE YOUR CHANCES OF WINNING. ALL FEDERAL, STATE, LOCAL, AND MUNICIPAL LAWS AND REGULATIONS APPLY. INTERNET ACCESS, VALID PUBLIC INSTAGRAM ACCOUNT, AND A VALID E-MAIL ADDRESS ARE REQUIRED TO ENTER THE PROMOTION. VOID WHERE PROHIBITED. Participation (using the hashtag #GiveBackLivForward) constitutes entrant's full and unconditional agreement to and acceptance of these Official Rules. Eligibility: The Giveaway is open to female participants 18 years of age or older as of the Giveaway Start Date. Contest Nominee is not restricted based on age or gender. If participant nominates a deceased individual, the participant must also nominate a person who will receive the prize on their behalf. Participant must have current contact information for nominee. Entries are only accepted from countries where Liv bikes, gear and apparel are sold. Employees, officers, and directors (including immediate family members and members of the same household) of the Sponsor, its parent company, subsidiaries, affiliates, retailers, distributors and advertising and promotion agencies, prize suppliers, and any other entities directly associated with this giveaway, are also not eligible to participate. Current Liv Cycling ambassadors are not eligible to apply. All federal, state and local laws and regulations apply. Void where prohibited. Nominating a person who introduced the participant to cycling by posting a video or photo to Instagram with a legible caption/story describing how that person introduced them to cycling. Posts must include both of the following hashtags: #GiveBackLivForward #LivForward. Facebook and Twitter posts will not be accepted, unless also shared on Instagram. Participant must also follow @LivCycling on Instagram. A person may be entered if nominated by another user on an Instagram Post. LIMIT five entries per person, per Instagram account, per email address. Each entry must nominate a different person. Multiple entries who nominate the same person will not be accepted. If a person is nominated by multiple people, all of those entries will be accepted. Once participant’s post is live on Instagram, the participant and their nominee will be entered for a chance to win one of two prize packages. Entrants give Liv Cycling, Giant Bicycles and/or any local sales company governed by Liv Cycling and/or Giant Bicycles the right to use the contestant’s videos, images, likeness, written words, name, location, and social media information on their social media and website for promotional purposes. Drawing and Notification: ONE Grand Prize winner and FIVE additional finalists will be selected after May 30, 2019 at 11:00 pm PST by the Sponsor whose decision is final and binding in all matters relating to this Giveaway. No entries will be accepted after 11:00 pm PST on May 30, 2019. Winners of the Give Back Liv Forward Contest will be selected based on the following criteria: Ability to follow contest rules; creativity of Instagram video, photo and/or caption; compatibility with Liv Cycling’s Liv Forward campaign; aptitude in written communication and social media; and country of residence. Odds of winning will depend on the total number of eligible entries received. Winners will be notified on or before June 21, 2019. Winners will be announced publicly with a web and social media launch on or before June 21, 2019. Failure to comply with any rules or falsified information provided by a selected winner may result in disqualification and selection of an alternate winner from all eligible entries received during the applicable entry period. Sponsor is not responsible for any change of Instagram account, e-mail address, mailing address and/or telephone number of entrants. The return of any prize/prize notification as undeliverable or the non-compliance with any other requirement may result in disqualification and an alternate winner will be selected. GRAND PRIZE: Winner of the Give Back Liv Forward Contest will be selected and notified on or before June 21, 2019. Winner (participant and nominee) will receive (1) Liv bicycle of winner’s choice valued under $6,000 USD at retail and subject to availability for herself AND (1) Liv OR Giant bicycle of nominee’s choice valued under $6,000 USD at retail and subject to availability. Winner and her nominee will also receive various apparel and gear items of varying value. Winner and/or nominee may choose to give the contents of their prize package to someone else in need. All contact information for anyone accepting prizes on the winner’s behalf must be provided within seven (7) calendar days of winning. Winner and nominee may be required to provide personal biography information, asked appear on Liv-owned video(s), be featured in Liv-owned photography, or contribute written content for Liv-Cycling.com and/or Liv social media. Winner must provide confirmation of eligibility and required personal information for herself and nominee within seven (7) calendar days of winning. Failure to comply may result in disqualification and selection of an alternate winner from all eligible entries. FINALIST PRIZE: FIVE finalists of the Give Back Liv Forward Contest will be selected and notified on or before June 21, 2019. Finalists (participant and nominee) will receive various apparel and gear items of varying value. Finalist and nominees may be required to provide personal biography information, asked appear on Liv-owned video(s), be featured in Liv-owned photography, or contribute written content for Liv-Cycling.com and/or Liv social media. Finalists must provide confirmation of eligibility and required personal information for herself and nominee within seven (7) calendar days of winning. Failure to comply may result in disqualification and selection of an alternate winner from all eligible entries. Prize Conditions: By accepting the Grand Prize and/or Finalist Prize participants and nominees agree to release the Sponsor, its parent company, subsidiaries, affiliates, retailers, distributors and advertising and promotion agencies, prize suppliers, and any other entities directly associated with this giveaway (collectively, “Released Parties”), along with each of their respective directors, officers, employees, shareholders and agents, from any and all liability whatsoever for any injuries, losses, or damages of any kind caused by entering the promotion or for damages of any kind caused by any prize or resulting from acceptance, possession, or use/misuse of any prize awarded. Prize winners will be solely responsible for all federal, state and local taxes. No substitution or transfer of prize or election of cash in lieu of prize will be permitted. The Sponsor and prize suppliers reserve the right at its sole discretion to substitute any prize package with another prize of equal or greater value in the event that the prize (or any component thereof) is not available. If a prize or prize notification is returned as unclaimed or undeliverable to a potential winner, or if potential winner cannot be reached within three (3) calendar days from the first notification attempt, or if a potential winner fails to return a requisite document within the specified time period, or if a potential winner is not in compliance with these Official Rules, then such person shall be disqualified and an alternate winner will be selected for any prize at issue. All taxes, if applicable, are the sole responsibility of the winner. The winner’s entry and acceptance of any prize offered constitutes permission for the Sponsor and prize suppliers to use said winner’s name, social media identity, photographs, videos, likeness, statements, biographical information, voice and address (city and state), in all forms of media, in perpetuity, without notice or further compensation. Internet Limitations of Liability: If for any reason this Giveaway is not capable of running as planned due to infection by computer virus, bugs, tampering, unauthorized intervention, fraud, technical failures, or any other causes beyond the control of the Sponsor which corrupt or affect the administration, security, fairness, integrity or proper conduct of this Giveaway, the Sponsor reserves the right at its sole discretion, to disqualify any individual who tampers with the entry process, and to cancel, terminate, modify or suspend the Giveaway in whole or in part, at any time, without notice and award the Grand Prize using all non-suspect eligible entries received as of, or after (if applicable) this cancellation, termination, modification or suspension date, or in any manner that is fair and equitable. Sponsor assumes no responsibility for any error, omission, interruption, deletion, defect, delay in operation or transmission, communications line failure, theft or destruction or unauthorized access to, or alteration of, entries. Sponsor is not responsible for any problems or technical malfunction of any telephone network or telephone lines, computer on-line systems, servers, or providers, computer equipment, software, failure of any e-mail or entry to be received by Sponsor on account of technical problems, human error or traffic congestion on the Internet or at any Website, or any combination thereof, including any injury or damage to participant's or any other person's computer relating to or resulting from participation in this Giveaway or downloading any materials in this Giveaway. CAUTION: ANY ATTEMPT TO DELIBERATELY DAMAGE ANY WEBSITE OR UNDERMINE THE LEGITIMATE OPERATION OF THE GIVEAWAY IS A VIOLATION OF CRIMINAL AND CIVIL LAWS AND SHOULD SUCH AN ATTEMPT BE MADE, THE SPONSOR RESERVES THE RIGHT TO SEEK DAMAGES OR OTHER REMEDIES FROM ANY SUCH PERSON (S) RESPONSIBLE FOR THE ATTEMPT TO THE FULLEST EXTENT PERMITTED BY LAW. In the event of a dispute as to the identity of a winner based on an e-mail address or Instagram account, the winning entry will be declared by the authorized account holder of the e-mail address submitted at time of entry. "Authorized account holder" is defined as the natural person who is assigned to an e-mail address by an Internet access provider, on-line service provider or other organization (e.g., business, educational, institution, etc.) that is responsible for assigning e-mail addresses for the domain associated with the submitted e-mail address. Liv Cycling, Giant Bicycles and #GiveBackLivForward Contest is in no way sponsored, endorsed or administered by, or associated with, Instagram, Inc.
Liv Cycling, Giant Bicycles and #GiveBackLivForward Contest is in no way sponsored, endorsed or administered by, or associated with Facebook. You understand that you are providing your information to Liv Cycling/ Giant Bicycles and not to Instagram or Facebook.